2D electronics is defined as an electronic product integrated with 2D materials. Rapidly evolving electronic industry has introduced electronic products which are highly efficient. For instance, integration of 2D nanoparticles with electronic devices results into a highly efficient device that is fast and compact. Further, various researches are still going on the development of 2D electronics. The global 2D electronics market is expected to post a robust CAGR over the forecast period i.e. 2017-2024. Further, 2D electronics market is anticipated to reach noteworthy revenue globally by 2024. Further, the market is growing on the back of various factors such growing application of 2D electronics in biomolecular sensing, optical communications, solar cells, security display and imaging and others. On the basis of product type, the global 2D electronics market is segmented into electronic devices and optoelectronic devices. Further, electronic devices segment is further sub-divided into chemical sensors, environmental sensors, transistors, biological sensors, and others. Among the above segments, electronic devices segment is anticipated to seize a considerable CAGR overt the forecast period forecast. Geographically, North America region is expected to account for the lion share in the global market of 2D electronics by 2024. Further, U.S. is believed to dominate the 2D electronics in this region owing to growing adoption of advance products along with increasing research and development activities in order to incorporate 2D electronics into devices. 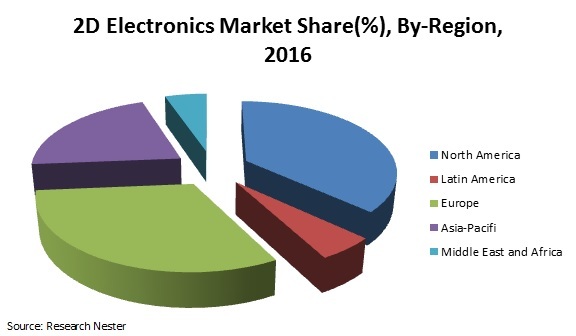 Moreover, presence of major market players of 2D electronics in this region is projected to foster the growth of 2D electronics market. Wide scale application of 2D electronics in various electronic and optoelectronic devices is anticipated to be the dynamic factor behind the rapid growth of 2D electronics market. Moreover, growing research and development activities by major key vendors is also expected to strengthen the market of 2D electronics over the forecast period. Likely, continuous advancement in the electronic devices and adoption of numerous sensors into a single electronic product are believed to flourish the growth of 2D electronics market all across the globe. Furthermore, various properties of 2D materials such as light weight, small structure and others are gaining attraction among the various electronic product manufacturers and growing demand for advanced technologies for energy conversion and storage is also envisioned to propel the demand for 2D electronics by the end of 2024. Although, integration of 2D electronics into the product could increase the overall cost the product which is projected to hamper the growth of 2D electronics market.